The lensmeter Marco 101, like all Marco lensmeters, is well suited for measuring soft and hard contact lenses as well as conventional spectacle lenses. The lensmeter Marco 101 is a compact deluxe model with a full 90-degree inclination, which facilitates the measurement of contact lenses when used in the vertical position. Standard equipment on the 101 includes such deluxe features as a prism compensator, external power and axis readings, and an American-style cross-line target. The oversized lens table permits the measurement of conventional lenses from 30 to 90 mm in diameter. 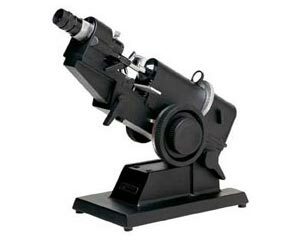 The instrument is well suited for laboratory or office use. The Lensmeter Marco 201 features internal readings for the presbyopic practitioner or those who prefer to work in subdued lighting where external readings are difficult. Standard features include a power range of -+25 diopters, an American-style cross-line target, a prism compensator, and a full 90-degree inclination. Are you done with the lensmeter marco 101 ? Go to lensmeter.